Grid Chicago is a blog about sustainable transportation matters, projects and culture in Chicago and Illinois, by John Greenfield and Steven Vance since June 2011. We switched to writing at Streetsblog Chicago in January 2013. Transition Plan: We’re making the move to Streetsblog Chicago! Chicago Crash Browser - Find where bicyclists and pedestrians were hit by cars in Chicago. Chicago Bike Guide app - The Chicago Bike Guide is the best way to navigate Chicago's vast network of bikeways and cool destinations. Get trip directions, find available Divvy bikes and docks, read The Chainlink, Tumblr, and Twitter, all giving you the perfect view of getting around by bike in Chicago. The app works on iPhone, iPod touch, iPad, and Android phones and tablets. Morse’s new bike parking area. Photo by Justin Haugens. The Chicago Transit Authority’s Morse Red Line station in Rogers Park, recently renovated, now has 45-108 new bike parking spaces (on what looks like 9 racks); the capacity depends on how people lock up their bikes. The bike rack type is called the “campus rack” and “hangers” are what you lean a bike against and lock to. The bike parking area is partially sheltered, has some lighting, is visible from multiple streets, and very close to a station entrance. The area is in the site of what used to be a retail space at approximately 1400 W Lunt Ave, at Greenwood Ave on the west side of the ‘L’ viaduct. Thorndale’s new bike parking area. Photo by Rudy Luciani. The Thorndale Red Line station received the same racks with an identical capacity. According to an email conversation I had with a CTA staffer and a staffer in 49th ward Alderman Joe Moore’s office, the area will be fenced with “two (2) 10′ openings exiting the bike lot to the north (sidewalk) and east (alley)”; these will not be gated entrances. A DIY bike repair stand, the seventh in Chicago (all installed in 2012), was also installed. The bike parking area is on the south side of Thorndale, across the street from the station entrance, in what used to be a car parking lot. Thorndale’s DIY bike repair stand. Photo by Rudy Luciani. I am awaiting funding cost and source information from the CTA. CDOT staff front row, l-r: Share the Road Coordinator Carlin Thomas, Deputy Commissioner Luann Hamilton, Bike Coordinator Ben Gomberg, Commissioner Gabe Klein. Wednesday Steven and I attended the quarterly Mayor’s Bicycle Advisory Council meeting at City Hall, a great opportunity for citizens to get updates on Chicago’s bike projects and network with planners and advocates. Currently the meetings are geared towards “stakeholders,” staff from various city departments, the park district, CTA, the Active Transportation Alliance and other nonprofits, but the general public is welcome to attend and ask questions at the end of the meeting. To get on the mailing list for MBAC meeting announcements contact Carlin Thomas at carlin.thomas[at]activetrans.org, or sign up on this webpage. Here are a few news items from the meeting. Although the bike sharing program failed to launch this year, Chicago Department of Transportation (CDOT) bike coordinator Ben Gomberg said things are on track for a spring 2013 debut. The project was awarded a total of $22 million in federal funding, which will pay for a system with 4,000 bikes and 400 rental kiosks (in two implementation phases). Gomberg said the current challenge is to find the required twenty percent local match of $5.5 million. CDOT has secured enough funding from Tax Increment Financing dollars and aldermanic menu money to cover the local match for the first year of operations. Gomberg joked that if anyone at meeting had a friend with a few extra million to donate, the city would gladly name the bike share system after the benefactor. Asked exactly when the system will launch next year, CDOT commissioner Gabe Klein said, “As soon as possible, as soon as the sun is shining and it’s 55, 60 degrees.” Gomberg added, “Let’s just say there’s an optimist and a pessimist in this room.” A potential speed bump is that Bike Chicago (a Grid Chicago sponsor) is contesting the contract, claiming that Alta Bike Share was given an unfair advantage in the bidding process. The case is currently under investigation by the city’s Office of Inspector General. In October the city will hold three public meetings across the city to introduce the program and ask for suggestions for the kiosk locations. Initially the boundaries of the service area will be Montrose Avenue, Damen Avenue, 43rd Street and Lake Michigan; in time the borders will expand, and hopefully most of the city will someday get bike share. CDOT has already identified about 150 locations for kiosks, mostly at CTA and Metra stations, but the city will also be creating a “crowdsourcing” website to solicit suggestions for locations, Gomberg said. When New York City did this they received over 8,000 recommendations. The CTA’s Chris Ziemann and Joe Iaccobucci gave an update on local efforts to create bus-priority corridors, including the impact on cycling. They compared the project to their agency’s work to eliminate slow zones on the ‘L’, suggesting that BRT routes on wide streets with high bus ridership will function like efficient rail lines. Construction of new bus facilities along Jeffrey Boulevard started last month and operations may start by the end of the year. Ziemann and Iaccobucci acknowledged that Jeffrey will “by no means” be true BRT, since its bus-only lanes will only exist on a portion of the route and only during rush hours. But they said the dedicated lanes plus other firsts like bus-priority traffic signals and a queue jump, will pave the way for more ambitious BRT projects. CTA rendering of a potential BRT lane configuration on Ashland. The CTA is currently studying 21-mile corridors on Western and Ashland Avenues as potential locations for more robust bus-priority routes. And the agency plans to complete design work for the Central Loop BRT from Union Station to Navy Pier by 2013, with construction happening in 2014. The project would include dedicated bus lanes, a new off-street bus terminal near the railroad station, level bus loading platforms, and protected bike lanes on Washington and Randolph streets. Download the CTA’s BRT slideshow. CDOT bikeways project manager Mike Amsden said the department is aware that removal of debris and snow from protected lanes will be a growing issue as the network expands. He showed a slide of broken glass in the new lanes on Elston Avenue. “We are working our tails off to figure out how to do this the best we can,” he said. Amsden added the city is looking into the possibility of purchasing a compact street cleaner especially for use on the bike lanes. Some of the amusingly named models they’re considering include the Madvac CN100, the Green Machine, the Elgin Broom Badger and the Nitehawk 200 Osprey, which sounds like a vehicle David Hasselhoff might drive. The city is also considering applying – no joke – a mixture of salt and beet juice to the protected lanes prior to snowfall to prevent accumulation. I assume this technique was pioneered in Denmark, where they eat beets with everything. The Nitehawk 200 Osprey: a lone crusader in a dangerous world of bike lane debris. Chris Gagnon, my successor as the city’s bike parking manager, is moving on after five years in the position and almost a decade at the bike program. Gagnon’s productive tour of duty saw the installation of some 3,000 bike racks and the city’s first on-street parking corrals. He reported that new corrals recently debuted in Andersonville next to the existing “People Spot” parklet, 5228 N. Clark Street, and in front of the Hopleaf bar, 5148 N. Clark. There will be a “Party in the People Spot” celebration of the new green space and racks this Friday from 5:30 – 7 p.m. at the parklet. Gagnon added that the city’s first year-round on-street parking corral is coming to Café Jumping Bean in Pilsen at 1439 W. 18th Street. One community member asked if CDOT could create a document or brochure that he could give to businesses that are interested in installing a bike rack they purchase. Commissioner Klein mentioned how in Washington, D.C., there was a program called Bike Brand Your Biz and said that the department will have a guide done by December on how a developer can get a bike rack. New on-street bike corral by the Andersonville People Spot. Photo courtesy of the Andersonville Development Corporation. Pat Dowell and 3rd Ward bike campers. Front row: Drummer, Stenzel and Tomas. Klein said the city will be using a number of strategies to get the word out about the incoming bike network. The Streets for Cycling 2020 Plan for 645 miles of bikeways is currently under review and which should be officially released next month. CDOT also has about $1 million set aside to create a “transportation demand management” (TDM) program this spring, which will help Chicagoans in up to three different communities find alternatives to single-occupancy vehicle trips, including cycling, possibly launching in the spring. In addition, the agency is creating a new website and blog to promote sustainable transportation options, similar to Washington, D.C.’s colorful goDCgo.com. “By December we’ll have something nice to present to you,” Klein promised. Updated September 20 to add information about bike parking for businesses and the CTA’s BRT slideshow. Wolfgang Scherreiks with his English-made Pashley Guv’nor. It’s ironic that I’ve written dozens of articles about efforts to make Chicago more like the bike-friendly cities of northern Europe, but until recently I’d never actually been to any of these places. Last month I finally made the trip across the pond to check out bike facilities in Berlin, Copenhagen and several towns in the Netherlands. It was inspiring to experience places where cycling, walking and transit are given at least as much respect as driving, with the result being livable, vibrant cities. During the trip I met up with various transportation advocates and bloggers to pick their brains about the local cycling scene, in hopes of gleaning ideas for Chicago. 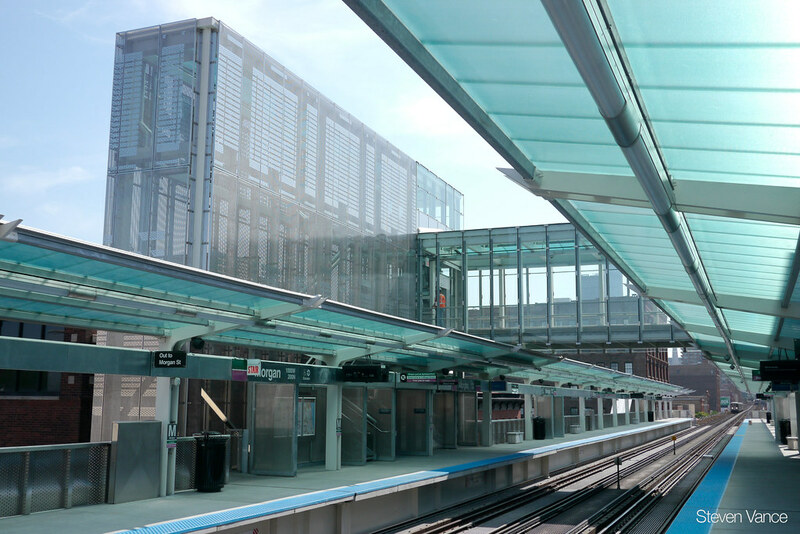 The fully enclosed glass and metal stairways and transfer bridge make an architectural and industrial statement in the growing West Loop neighborhood. The CTA has opened two new stations within three weeks of each other. The first was Oakton-Skokie on the Yellow Line in Skokie, Illinois, on April 30, and today the Morgan Green/Pink Line station opened (without fanfare). A grand opening will likely happen June 1. Bike parking for more than 40 bicycles at the 57th Street entrance to the 55th-56th-57th Street Metra station.